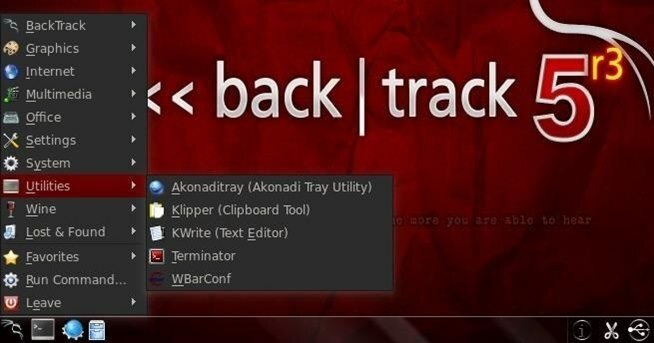 Similar to Windows start button, we have a button with the BackTrack icon in the lower left-hand corner along the lower panel. When you click on it, it opens up a collection of multi-nested menus just like Windows. Let's go through each of them from bottom to top. The first menu we come to is titled "Leave." 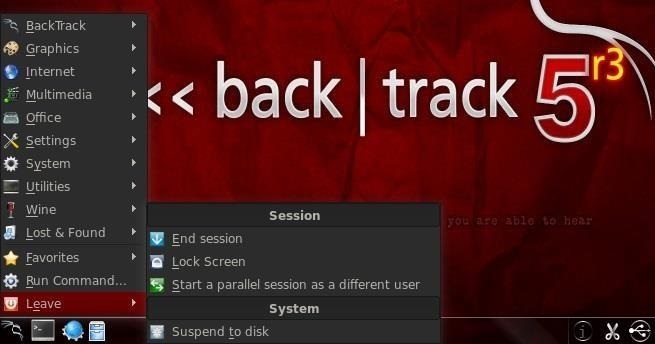 This is where we would go when we want to shutdown BackTrack. The sub-menus here are all self-explanatory. We're going to skip over a few menu choices as they are not salient to our hacking tutorials, so go up to "Utilities." The next menu we'll look at is titled "System," which contains applications that are crucial to the hacker. When we hover over System we seeAiroscript-ng and Airoscript-ng GTK. These are scripts for using Aircrack-ng to hack wireless. I'll do a tutorial on those in the near future, so stay tuned. Now we're going to jump up to the "Internet" menu and we can seeEtherApe appears here again (it was also under "System"). 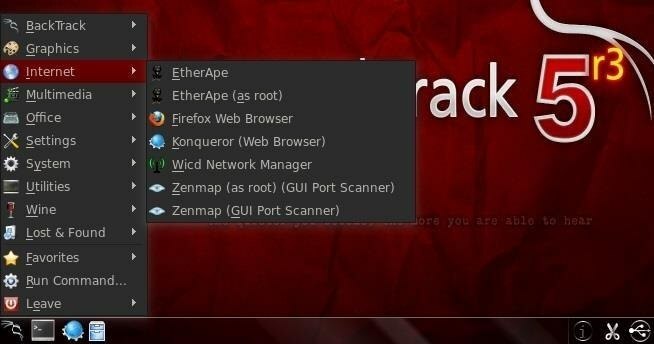 Zenmap (the network reconnaissance tool nmap overlaid with a nice GUI). We'll be using nmap for target reconnaissance in a tutorial coming soon. 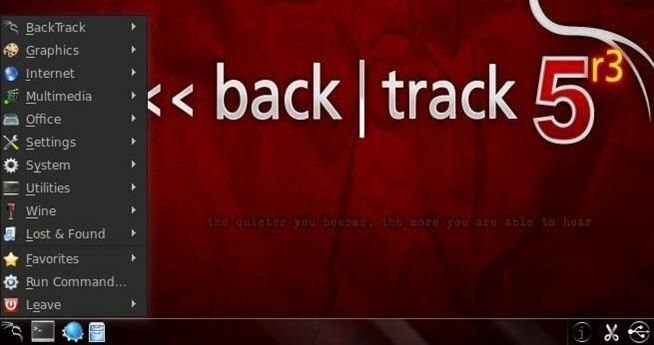 At the very top of the menu, we find the "BackTrack" menu! This is where we'll be spending most of our time as hackers. The BackTrack menu has shortcuts to the hundreds of hacking tools in BackTrack. Over the next several tutorials, we'll examine each of these set of tools. If we hover over "Exploitation Tools," those of you who have following my earlier tutorials will see some familiar territory. 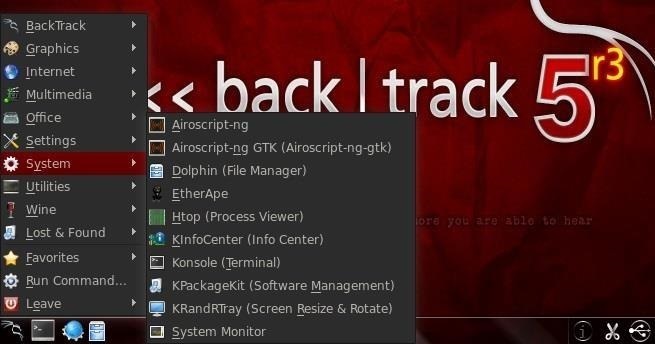 Exploitation Tools opens a sub-menu of numerous types of Exploitation Tools and if we hover over "Network Exploitation" we will see my favorite tool, "Metasploit Framework." For those of you who are just getting started in hacking, Metasploit is a powerful network exploitation tool and I have a number Metasploit tutorials here, so take a look at them if you aspire to become an expert hacker. 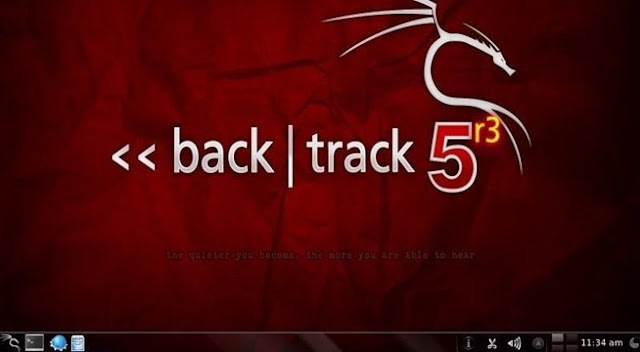 So that's the quick and dirty tour of BackTrack, my fledgling hackers. In my coming tutorials, I'll show you how to use many of the best hacking tools in BackTrack, so keep coming back!